This information has been made possible by funding from the U.S. Geological Survey Cooperative Water Program and National Streamflow Information Program and New York City Department of Environmental Protection, New York State Department of Environmental Conservation, New York State Department of Health, Hudson Valley Regional Council (representing Dutchess, Orange, Putnam, Rockland, Ulster, and Westchester Counties), the Hudson River-Black River Regulating District, and the City of Poughkeepsie, NY. Current salt-front location in the Hudson River (map, table, tab delimitted). Location, in river miles above The Battery, New York City, is a daily value for the most upstream location (at high slack tide) for the previous day. The salt front is defined as 100 mg/L chloride concentration; and measured in the field as a specific conductance of 510 microsiemens per centimeter at 25 degrees Celsius (see conversion chart). 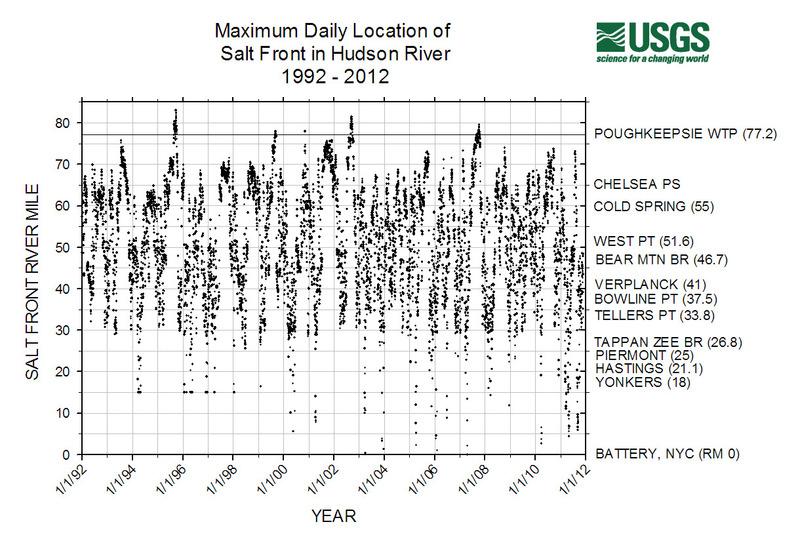 Historical daily salt-front location in the Hudson River for the period of record, 1991 to current water year (tab delimitted, scatter-plot jpg). To view and print the postscript (.ps) files from your browser, download, (free), the GSview utility. Bathymetry data from report "Cross Sections of the Hudson River Estuary from Troy to New York City, New York" by David A. Stedfast -- CGAP data file description, CGAP data file for river mile 21 to 49 (Hastings-on-Hudson to West Point), CGAP data file for river mile 51 to 153 (West Point to Troy). Photograph of Hudson River looking north toward Bear Mtn. Bridge (located on map at point where Putnam, Rockland, and Westchester Counties meet) and West Point. In foreground is Doodletown Bight and Salisbury Meadow; Iona Island is at right (hudriver.gif 39k). IE browsers only-->Other photographs include commercial ship traffic, tidal wetland across from West Point, aerial view of Croton Point, salt-front monitoring gages, meteorologic, specific conductance and tide-stage measuring equipment, leveling in gages to a common datum, acoustic Doppler current profiling equipment (ADCP) used for discharge measurements, and ADCP current profiles showing bi-directional flow in a Hudson River cross-section.